As teen and young-adult drivers prepare to go back to school, parents are encouraged to use this moment as an opportunity to discuss proper auto care and how that impacts vehicle safety. According to State Farm, 56 percent of teenagers rely on their parents to learn how to drive. This means that in addition to helping teenagers get behind the wheel and drive safely, parents must also teach kids proper car care. To help support families having these important conversations, Cottman Transmission and Total Auto Care today released a list of tips to help parents best advise their children. Be familiar with the air pressure level of the car’s tires, how to tell when a tire might need air and which weather conditions contribute to rapid tire deflation. Additionally, Cottman’s car experts recommend that new drivers be comfortable with refilling the air in tires and watching for the warning signs of worn-down tires. Dashboard warning lights should set off alarm bells in any driver’s head, and should not be ignored. These warning lights can include the check engine light, oil light, brake light, temperature light and more. Check any light with the car’s owner manual and see how to respond. With today’s more technologically advanced vehicles, the warning signs are more accurate than ever before. The windshield is essential to the safety of anyone’s driving – it should be in good condition, clear and free of debris. Even a small crack in a windshield – from a rogue rock, hail or a falling tree branch – can cause destructive spider webs of cracks over time that can seriously impact vision, as well as impair the windshield’s ability to protect drivers in an accident. If a crack occurs, get it fixed immediately. Every teen should familiarize themselves with their car’s maintenance schedules. In particular, it is important to keep a pulse on a vehicle’s fluids, brakes and filters, as these items require regular care. For example, a vehicle’s engine air filter should be replaced about every 30,000 miles. It’s happened to all of us – we’re driving along, then suddenly look down and realize the tank is almost empty. Teach teens to be vigilant about fuel levels and to err on the side of safety by refilling once the tank is less than a quarter full, especially in cold weather and on long drives back to school. Another resource available to drivers interested in easy-to-understand auto tips is Cottman Man’s Educational Video Series, which was recently released as an informational resource about relevant consumer preventative and proactive car care tips. To view The Cottman Man Educational Video Series, visit https://cottman.com/videos/. 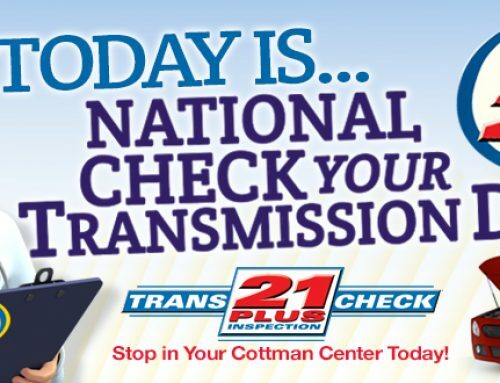 And, to learn more about Cottman Transmission and Total Auto Care, please visit https://cottman.com.